Riplaces. They perfected my idea. Many years ago... so long I couldn't even guess a number, I decided shoe laces weren't good for fast transitions. There were no after market options at the time. My first solution was simplest and cheapest. 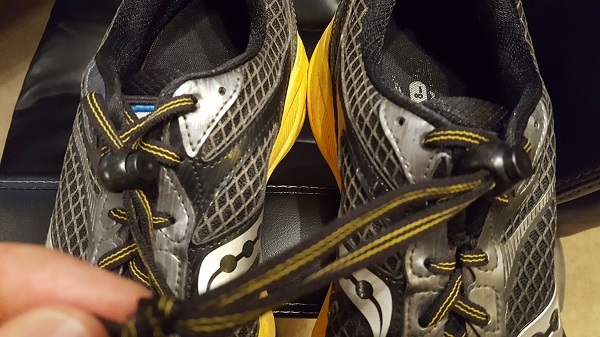 Use the laces that came with the sneakers but instead of tying a knot, run the laces through a spring loaded plastic lace lock. Just trim the excess lace and tie it off in a knot. During transition, just slide the lock down the lace and off you go. This worked well for me for many years. The photo below is from 1987 and you can see I was using this lacing technique at the time. 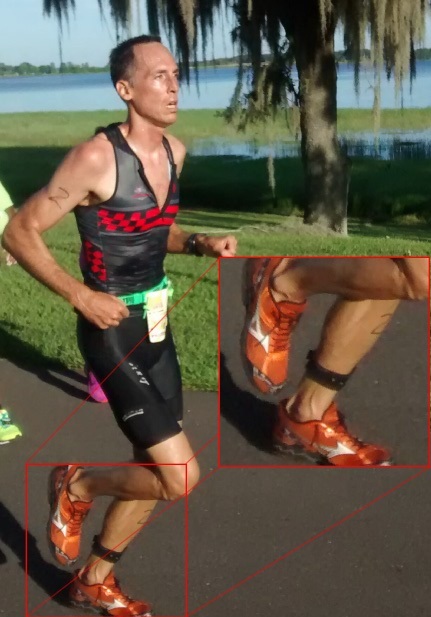 As my running distances increased and I set my sights on Ironman competition, I needed to improve this solution. 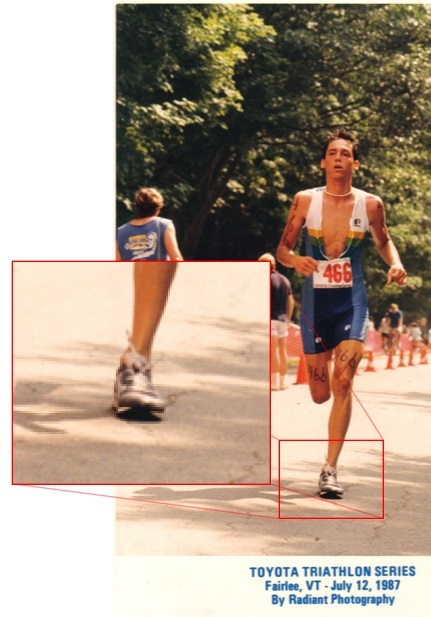 Over the course of a marathon, my feet would swell and the lace locks would become too tight. My solution was to buy 3/32" bungee cord in bulk. When Ebay came along, that got a lot easier. I could buy 100 feet for about $7. 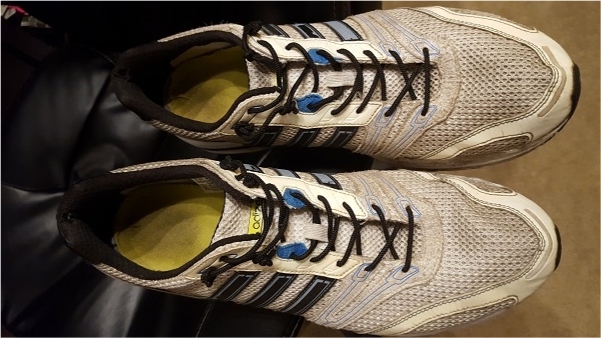 I laced my running sneakers with a short length and knotted the ends. Each 100 foot roll would last me several years. I could adjust the tension by moving the knot and distributing the tension evenly over the entire length of the lace. Over long distance the bungee would give just enough to allow my feet to swell and not get so tight as to cause pain or discomfort. They were a little tough to lace because the bungee end would fray a bit. 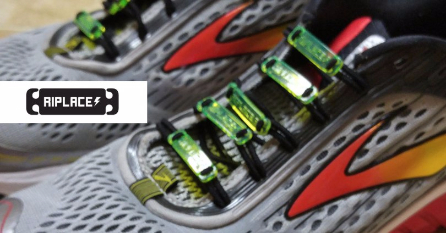 If you burned the end to keep it from fraying, you end up with a mushroom-like cap that makes it hard to poke through the lace holes in the shoe. I experimented a few times with tying short individual lengths directly between opposite eyelets, but found I could not get enough tension with a single strand of bungee like that. I used this technique starting in the early 2000's. The photo below is from 2015. In the 2000's my lacing sophistication and development hit the wall. It bonked. I did not advance my design. But a few months ago I heard about Riplaces. As I looked closely at these, I realized they must've been spying on me all these years. 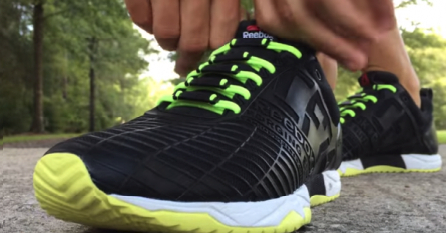 I kept my lacing strategy a secret (until now). It was my secret speed weapon! But somehow Riplaces took all the research and development I did over the years and ran with it. Now Riplaces has perfected what I started. With Riplaces you get individual loops of bungee, a threading tool and a plastic connector called a core. The bungees connect to opposite eyelets attached in front by the core. So you have two lengths of bungee between each set of eyelets. Perfect! Even more, with Riplaces you get 5 different length bungees so you can customize the tension at each eyelet. No other system has this feature! 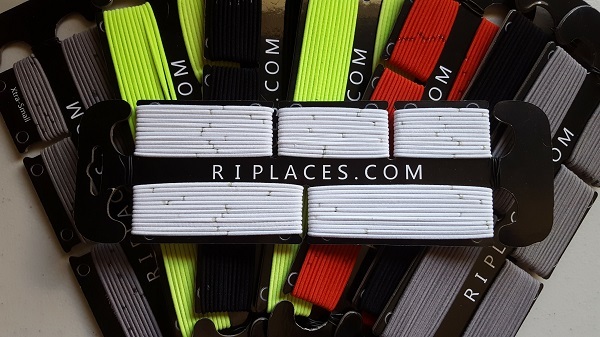 Riplaces come in a variety of stylish colors. You can mix and match different color bungees and cores. That makes a nearly endless variety of combinations for you fashion conscious athletes. They're just $15 for each complete set. But TriFuelMonthly subscribers will get TWO complete sets with April 1st deliveries! I'm really happy to be able to offer this to you for free this month. It's the best solution on the market for quick T2 times! Of course my humor is all tongue in cheek. I am truly excited about Riplaces design. 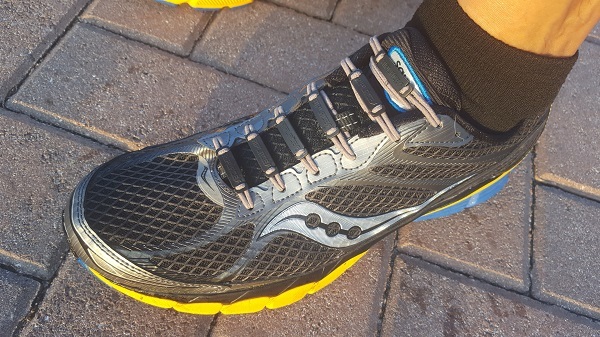 The fact that it extends my experience to a better place makes me all the more confident that this will be your favorite lacing system for a long long time!